Another form of injectable we offer involves Platelet Rich Plasma (PRP) therapy. Also known as Vampire Facial the goal of PRP therapy is to use your blood plasma to accelerate tissue repair and regeneration in the skin, resulting in tighter, healthier-looking skin. If you show signs of aging, such as grayer-looking skin, droopy skin, or uneven texture, then PRP or Vampire Facial procedures are great rejuvenation methods for the face. 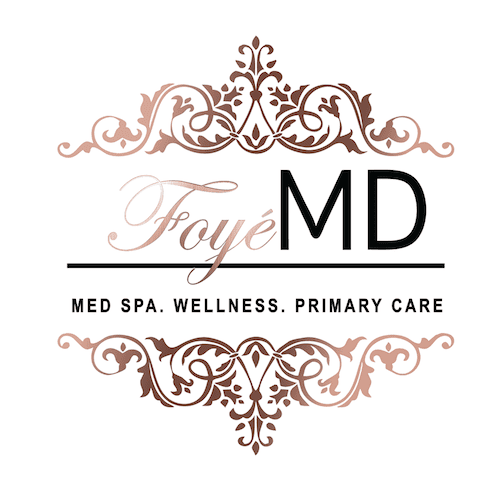 Foyé MD and Spa is excited to offer this treatment for restoring shape, improving tone and texture, and regenerating new and younger tissue. Want to know if you're a candidate for this revolutionary treatment?Schedule a complimentary consultation today to learn more about how our PRP or Vampire PRP Facial procedures can naturally improve the look of your appearance and other possible treatment options to restore younger-looking skin. The famous Vampire PRP Facial has gained exposure in the celebrity world thanks to stars such as Kim Kardashian. The goal of the Vampire PRP Facial involves taking a small amount of your blood and applying it to your face topically and transdermally. The procedure also involves dermal stimulation with a micro-needle for simultaneous collagen induction therapy. The direct delivery of the PRP to the dermis enhances the treatment, allowing for further growth of the collagen and tissue. The benefits of this treatment can be noticed as early as one week following the treatment, and can last for months. Using hyaluronic acid (HA) fillers (like Restylane or Juvederm) in a very specific way, the physician will sculpt a younger-looking face while still retaining the natural shape of the face. This is where the name “Vampire PRP Facial” comes from because the growth factors that are utilized in this procedure come from the patient’s own body. Approximately two teaspoons of blood are drawn, from which platelets are isolated using a centrifuge. The platelets are “activated” to release at least eight growth factors that are normally used to heal injured tissue. Using numbing cream and a very small needle (minimizing pain and bruising), the physician will then inject the growth factors back into the patient’s face in a specific way. These growth factors will activate multipotent stem cells found within the skin, tricking them into thinking that there’s been an injury that needs treating. The patented ingredient found in Alter™, SBD-4, helps enhance the effects of the treatment by stimulating blood flow to the targeted areas. As a result the stem cells develop new collagen, blood vessels, and fatty tissue to make the skin appear brighter, smoother, and overall younger than before. What is the difference between the Vampire PRP Facial and the PRP Facelift™?The Vampire PRP Facial does not involve an injection; the platelet rich plasma (PRP) is applied directly to the skin while the fine needles of the micro-needle creates entrances in the pores within the top layers of the skin. How does the PRP Facelift™ work? Blood is full of growth factors (PRP) that contain healing properties that increase immunity. Medical practitioners harvest platelet-rich plasma (PRP) by drawing blood and placing it in a centrifuge. Here the spinning process separates the growth factors from the other blood components. The extracted PRP serum is micro-needled into the skin. The needle punctures create trauma that activates the natural healing response. As a result, collagen and elastin production is boosted in the skin. What are the benefits of the PRP Facelift™? The procedure results in youthful and healthier looking skin; the treatment aids in tissue repair and growth in areas where the platelets are injected. The treatment also helps in tightening and thickening the skin for wrinkle reduction and improved skin texture. Many of our clients have also reported an increased glow to the skin following the procedure. Procedure Performed?A sample of blood is drawn, prepared and placed into a centrifuge for spinning. A liquid containing a highly concentrated form of platelet-rich plasma is extracted. PRP is used with micro-needling, to penetrates the facial skin through the tiny puncture wounds under local anesthesia. Who are the Best Candidates for Vampire PRP Facial? The Vampire PRP Facial is a safe and natural procedure that uses the body’s own platelets. There is a reduces chance of an allergic reaction. PRP is an effective treatment for adults of all skin types, all ethnic groups and of all ages. We recommend the procedure for anyone with volume loss, dull-looking skin, uneven skin texture due to aging or environmental elements. This treatment is also ideal for those looking for a non-invasive, natural solution for healthier, younger-looking skin. How Long are the Vampire PRP Facial? Both the Vampire PRP Facial and the PRP Facelift™ are performed in about 20–30 minutes. At Foyé MD and Spa we recommend that patients plan for a 60–90-minute visit. We need time to apply the local anesthetic, draw blood, and process the specimen for the PRP procedure. Is the PRP Facelift™ Painful? No! The treatment area is numbed during the procedure with an anesthetic cream. After the liquid is applied to the face, a micro-needling tool is used to glide the growth factors carefully along the skin. After the PRP Facelift™, there might be some mild redness, inflammation and bruising, which will subside in a few days. How Many Vampire PRP Facial Will I Need? For optimal results, most Foyé MD and Spa patients require 3–4 treatments scheduled every 4–6 weeks. The face instantly looks brighter, with some redness about 24 hours post-treatment. Over time, the facial skin continues to heal and rejuvenate itself, leading to reduced scarring and wrinkles and a more youthful complexion. The effects of the procedure improve for 2–3 months afterward and last for at least one to two years.